Leading medical supplies company, DP Medical Systems, has lent its support to a charitable outreach programme, designed to provide medical care to communities in West Africa. The Surrey-based company teamed up with Mr Wale Olarinde, consultant ENT/ head & neck surgeon to provide ENT outpatient equipment for the outreach programme, which saw a team of surgeons, nurses and anaesthetists travel to Burkina Faso in February. During their trip, the team of experts provided much-needed surgery and medical procedures to the local community, seeing approximately 200 patients during their one-week stay. DP Medical supported the mission by loaning a state-of-the-art flexible nasendscope, examination headlight and single use ENT instruments including forceps and ear and nasal speculas. Mr Olarinde, said: “We’re very grateful for the support DP Medical has given us. The outreach programme to Burkina Faso plays a critical role in the health and wellbeing of the communities there. Owen Pemberton, commercial director at DP Medical, said: “It’s an honour to have played a role in Mr Olarinde and his team’s outreach to West Africa. Celebrating its 30th year in business, DP Medical supports many charitable and community causes, teaming up with the company SheffMed in 2016 to raise funds for ENT Africa. The firm, which recently announced its best results in almost a decade, also delivers educational masterclasses and training seminars to help upskill ENT consultants, such as its recent masterclass in Transnasal Oesophagoscopy technology, held at the Queen Elizabeth Hospital in Birmingham. Top kindle prize for Shane! We’re delighted to announce the winner of our customer satisfaction survey competition. 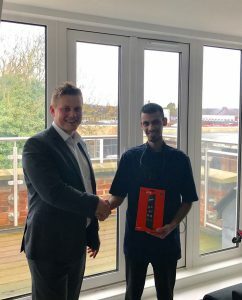 Shane Khaki, of the Flitwick High Street Dental in Bedfordshire, sent us some feedback via our customer survey following an order he placed and was picked at random to win a Kindle Fire HD. And our very own Owen Pemberton, commercial director at DP Medical Systems, was able to hand over the prize in person to Shane. 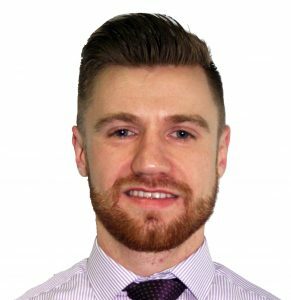 Said Owen: “We’re always looking for valuable feedback from our customers to make sure we are providing the best customer service that we can. The comments people provide in our customer survey can really help us to enhance our offering. Leading UK medical supplies firm, DP Medical Systems, has reported its highest sales figures in almost a decade. The company, based in Chessington, Surrey, enjoyed an increase in sales of 11% across both its hospital and dental divisions last year compared to 2015, thanks to new product ranges, increased international sales and excellent customer service. Doug Pitman, managing director of DP Medicals Systems, said: “DP Medical has grown significantly since the business was first founded in 1987 and we are delighted with our latest results. “We aim to service niche areas within the medical and surgical field targeting magnification, clinical imagery and scanning. Having this very clear business focus has helped us to provide our customers with a high quality service and a top range of products that we know inside out. 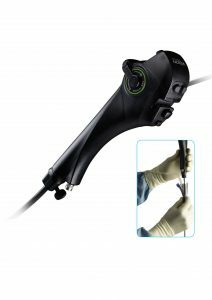 “We’ve also launched new products such as becoming the only exclusive UK distributor for the XION range, one of the world’s most renowned manufacturers of complete endoscopy systems which has given us immediate success in the UK market and we are confident this will continue in 2017. “In addition, we have enjoyed more international orders including from France and Egypt than in previous years and we predict further growth in these emerging international markets in the future. ENT specialists from across the UK gathered at Birmingham’s Queen Elizabeth Hospital for a masterclass in Transnasal Oesophagoscopy (TNO) technology. Hosted by DP Medical Systems, the day-long event saw a faculty of well-reputed ENT experts share their experience and knowledge of the technology, which is used for a variety of applications, from diagnostics to biopsies. Attendees then trialled the technology themselves, performing the TNO procedure on volunteer patients under the supervision of the faculty, which was led by esteemed consultant ENT head and neck surgeon Mriganka De. He was joined on the day by consultant otolaryngologist Yakubu Karagama, senior speech and language therapist Kate Young, ENT consultant surgeon Paul Pracy and George Garas, SpR ENT Head and Neck Surgery. Owen Pemberton, commercial director at DP Medical Systems, said: “The TNO event in Birmingham gave attendees a detailed insight into the technology, its applications and its benefits. “At a time when the NHS is under a lot of pressure to cut waiting times and make savings, the transnasal oesophagoscopy procedure presents numerous advantages, from speed and patient comfort through to patient safety. “It enables ENT consultants to see more patients, quicker, but without compromising on standards. The slim scope can be used to see right down into the patient’s stomach in a matter of minutes and without sedation, meaning faster turnaround in clinic, fewer outpatient appointments and quicker diagnosis. Speaking at the event, Mriganka De, consultant ENT head and neck surgeon said: “I’m confident that today we’ve achieved our aim, which was to increase enthusiasm for the TNO procedure. Based in Surrey, DP Medical Systems – which is celebrating its 30th year in business – supplies a wide range of ENT products and equipment to the healthcare sector in the UK. 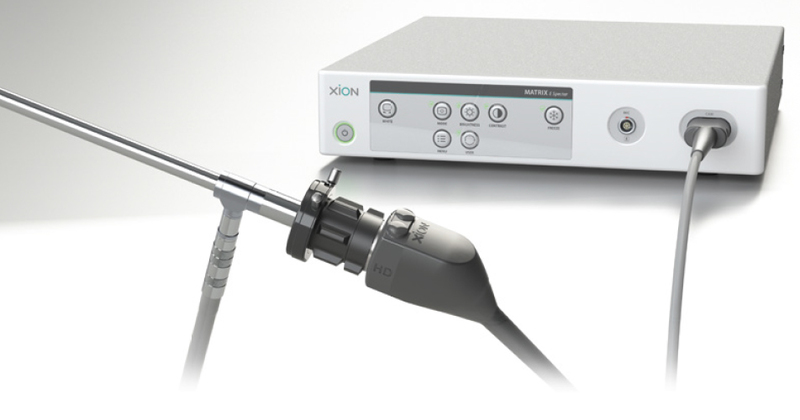 In 2016, it was named the exclusive UK distributor of XION Medical – the Berlin-based manufacturer of complete endoscopy systems. A one day course designed to showcase the latest in Transnasal Oesophagoscopy (TNO) technology has been announced by healthcare supplies firm, DP Medical Systems. The interactive course is set to take place on Friday 10 February 2017 at QE Hospital in Birmingham and will see a faculty of experts deliver educational lectures on the technology and its application, before delivering an afternoon of live, hands-on skills station demonstrations for attendees. The course faculty is made up of consultant head and neck surgeons Mriganka De, Yakubu Karagama – Consultant Otolaryngologist; senior speech and language therapist Kate Young; consultant ENT surgeon Declan Costello; and George Garas SpR ENT – Head and Neck surgery. Owen Pemberton, commercial director at DP Medical Systems – hosts of the event, said: “We’re really looking forward to welcoming consultants, ENT SpRs and trainees to our Transnasal Oesophagoscopy Course in Birmingham in early 2017. “The outpatient technology – which consists of a fibreoptic camera that is put up the nose into the throat and oesophagus – is quick and pain-free for patients, and is a great way of assessing those areas in just five minutes. “Performed in the Outpatient Department, it can save hospitals money by early diagnosis of impending oesophageal problems, plus can often avoid the need to treat patients in the operating theatre with a full anaesthetic. “Some patients are not fit enough for a general anaesthetic, so TNO is an alternative performed with a local, topical anaesthetic spray. The course, which runs from 09:30am – 4:00pm and costs £150 for consultants or £100 for ENT SpRs and trainees, also counts towards six CPD credits. Cervical screening patients in France will now benefit from innovative new scanning equipment thanks to DP Medical Systems. MediScan, a pioneering capture and archive system for gynaecological examinations, has recently been translated into French and Hopital Nord in Marseille is one of the first hospitals to have the system installed. The technology is already in use across the UK and provides clinicians with a secure pathway for recording, storing and encrypting patient gynaecology examinations for analysis and archiving. The still images and video are captured in real-time and stored against the patient record for retrieval anywhere in the hospital. The system, developed by DP Medical Systems, uses a simple to operate user interface, including touch screen technology and a question and answer based approach to data entry. Its digital still or video images are seen as benchmark quality by leading clinicians and have been used for illustration in medical texts. Prof Xavier Carcopino from Hopital Nord and who will be using the Mediscan, said: “I first worked with the Mediscan technology during a year at Dublin’s Adelaide and Meath hospital and Coombe’s women’s hospital and was very impressed with it. It is a highly beneficial piece of equipment because it is designed to answer to the need of clinician and is very adaptable. Due to the storage capabilities, from images, videos and research to letters editing and patients illustration, Mediscan allows clinicians to get a real understanding of a patients current problem so we can decide how best to treat and manage them. Owen Pemberton, commercial director at DP Medical Ltd, said: “It has been a pleasure to work with Prof Carcopino and all his team who have been instrumental in developing the French translation which means we can open up Mediscan to a whole new audience. 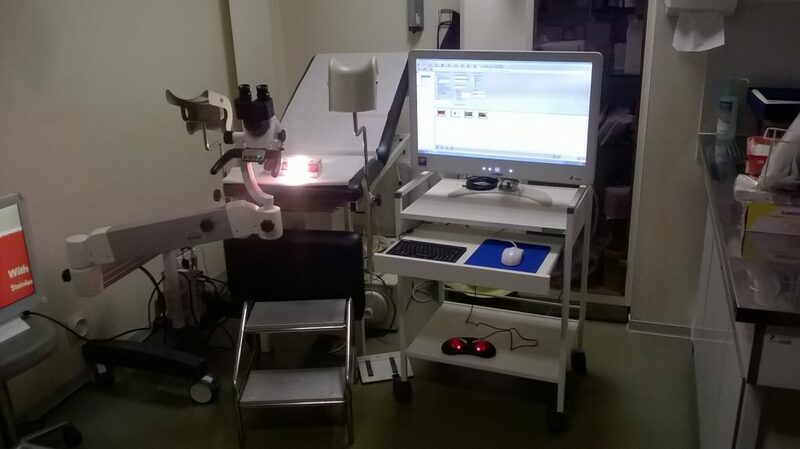 We are delighted to see Medicscan fully up and running at Hopital Nord and we hope this will be one of many in France. 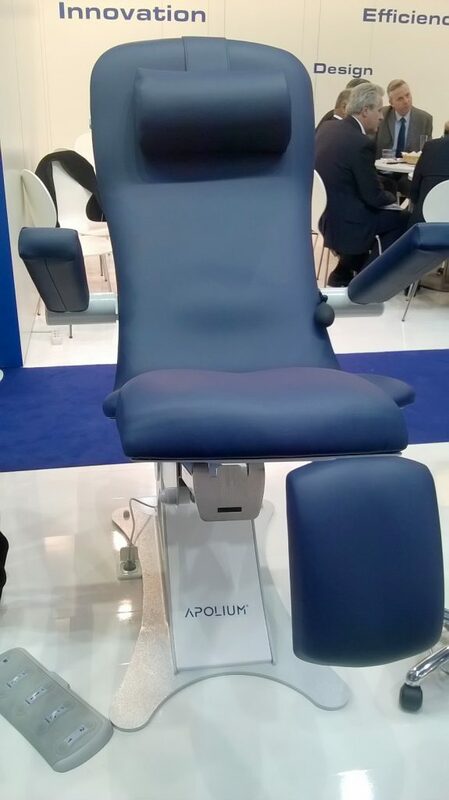 A team from DP Medical Systems was on hand at the prestigious Dental Showcase recently. The event, hosted on 6-8 October 2016, was organised by the British Dental Industry Association (BDIA) and held at the ExCel in London. Doug Pitman, managing director of DP Medical Systems; said: “We exhibit annually at this major Dental Exhibition and it really is a highlight of our events calendar. “This year we had a 25 sq. meter open plan exhibition space on the main aisle at the front of the hall manned by a six-strong team including representatives from our major suppliers, Global and Surgitel. “As in previous years, visitor numbers increased across the three days attracted by the new Global A series Dental Microscope which sets new standards in microsurgical dentistry. Several orders were taken during the meeting which will be delivered and in use by late November and we were also pleased to hear from many other dentists who expressed a strong interest in the products. “The Surgitel range of loupes and lights, which represent excellent value at the quality end of the market, were also displayed, demonstrated and orders take throughout the exhibition. Many customers commented on the very competitive prices offered for these product which outperformed other higher priced competitors.